I welcome atheists to write about their problems or issues with God/Religion/Faith. Please comment below. Were you once a believer or always an atheist? If you were a believer, what made you disbelieve in God/Religion/Faith? Please keep it polite, intellectual, humble, honest but without offending anyone. No profanity because it is distasteful and I want people of all ages to view my blog, not just adults. Labels: Atheism, Atheists, Faith, God, Religion. Born an atheist - like everyone else ever. Perhaps a child's belief in a god since so many people banged on about it in the same way a child believes in Santa and the Easter Bunny, stopped believing in all of them at around the same time (6-8). 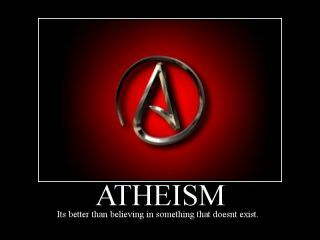 To all intents and purposes, always an atheist. This has been handled already by We Are Atheism and the Dawkins Foundation. Instead of wasting time and bandwidth asking people to do it all again for your benefit, why don't you do some work yourself, look those examples yourself, and post the links? Fil Salustri, I prefer taking a more personal approach. I assume that those who comment here are people I have already communicated with on Twitter or Facebook. So rather than read posts on other sites, I prefer those who know of me or have engaged me to give their thoughts on the matter. The sites you mention are propaganda and most likely any posts there are faux. Yes, I was raised Roman Catholic. It was when I began to seriously consider the priesthood that I began to question the very foundations of faith. This was based on a more in depth research of the Bible as it has been altered throughout history. The problems I have with faith are simple. If I were to have been born in another era, or another country where a different dominant faith were practiced, then where would I be? Religious texts themselves, as well as glaring contradictions found in the very nature of reality caused me to lose faith in the concept of God or gods. However, I do not claim that such things are impossible. To do so would be to claim that I have all knowledge of an infinite universe, which is scientifically false. @sacerdotus (cc @IsThisATweet @Rev_Xavier) I liked your Santa discussion on your blog (http://sacerdotvs.blogspot.com/2011/11/atheism-dilemma-ii.html) Let's do as you suggest. After that research we begin to test what we know so far. The bible makes several easily testable claims; let's take just one. Matt 18:19 claims that Jesus said "Again, truly I tell you that if two of you on earth agree about anything they ask for, it will be done for them by my Father in heaven." So we gather 3 people and they pray to god to restore my friend's leg (which he lost in an accident many years ago) within the week. God fails this test. Hmm. What are the explanations? God works in mysterious ways; god always answers prayers, but sometimes the answer is no. Wait, those doesn't explain falsehood of Jesus' claim. The claim has been falsified. Possibilities: God does not exist; Jesus did not tell the truth; Jesus did not actually make that claim, and Bible is inaccurate. Now after these tests, we analyze what we know and found from testing and come to the conclusion that... god does not appear to exist, or at least the Christian god is proved false.